I hope you don’t just love me for my macros. If so, we’re in trouble with this recipe. I hope you’ll forgive me. This is an old tried and true recipe that’s worth trying and just throwing macro caution to the wind. The Kid and I love Asian recipes and in particular, she has a thing for pot stickers. Those little bundles of meat and veggies that you dip in soy sauce or ponzu. Yeah, she’s a pretty cheap date until you figure out she can eat her weight in pot stickers. Needless to say, I figured out a way to make it happen at home so that I didn’t have to mortgage the house. I’ve made these several times and every time I use different ingredients. It is seriously a make it your own/use what you have recipe which is why I love it so much. The amounts are all estimates because I didn’t weigh or measure anything. Hence the lack of nutritional info this time. I’ve used spinach, mushrooms, ground pork, and onions for the filling. 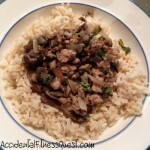 This time I used turkey, bok choy, mushrooms, onion and eggplant. The eggplant was an after thought. I have a real eggplant plant in my backyard that’s going crazy. I was desperate to use some of it so it went in. The Kid never noticed and I had 1/2 cup less eggplant to worry about. Use the veggies you’ve got and experiment a bit. I do recommend onion for flavor, but you can try spinach, kale, bok choy, different mushrooms, eggplant, shredded carrots, bamboo shoots. Really, whatev. If you want a vegetarian option, leave out the meal altogether. If you have leftover filling, I’ll give you an idea in a sec on what you can do with it. If you don’t have enough and you have leftover wrappers, freeze them or you can even fry them and sprinkle with sugar to have them for dessert. Dice all of the veggies into small pieces. They will shrink in size a bit as they cook, but you want them small since you’re going to stuff them into pot stickers. Chunks won’t work well. Mine were slightly larger than pea sized. Heat a large pan with a lid over medium heat, and add the veggies and ground turkey. Cook on medium for about 7-8 minutes until the turkey is done and no longer pink. Break the turkey up into small chunks as it cooks. The veggies will soften nicely as the turkey cooks. Remove from heat and sprinkle with the soy sauce, vinegar, lemon juice and ginger. Stir well to combine and break up any remaining larger chunks. Place a wonton wrapper on a cutting board and moisten it slightly with water. Put about 2 teaspoons of the meat filling in the center. Pull one set of opposite corners together and press to seal. Bring the other opposite corners up and press. 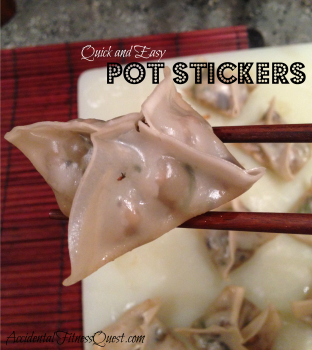 Press the seams to seal the pot sticker into a cute little bundle. Set aside and repeat with the remaining wonton wrappers. You may have leftover filling to save for later. Heat the pan again over medium heat and add 2 Tbsp of the oil. Swirl the bottom of the pan to coat. 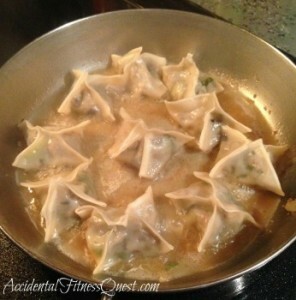 Place half the pot stickers in the pan and cook for about 2 minutes until the bottoms begin to turn golden brown. Carefully pour in 1/2 cup of water and cover the pan. Steam the pot stickers for 4 minutes and remove the lid. Cook uncovered for about 3 more minutes until the water has evaporated off. Remove the pot stickers with a spatula. Because these are so versatile, I decided to dub them Kitchen Sink Pot Stickers. Let me know what veggie combo you came up with for yours. I’m always looking for new variations.